This volume gathers papers from twenty prominent Mesoamerican archaeologists, linguists, and ethnographers to present a state-of-the-art survey of ritual cave use in Mesoamerica from Pre-Columbian times to the present. As portals to the supernatural realm that creates and animates the universe, caves have always been held sacred by the peoples of Mesoamerica. From ancient times to the present, Mesoamericans have made pilgrimages to caves for ceremonies ranging from rituals of passage to petitions for rain and a plentiful harvest. So important were caves to the pre-Hispanic peoples that they are mentioned in Maya hieroglyphic writing and portrayed in the Central Mexican and Oaxacan pictorial codices. Many ancient settlements were located in proximity to caves. This volume gathers papers from twenty prominent Mesoamerican archaeologists, linguists, and ethnographers to present a state-of-the-art survey of ritual cave use in Mesoamerica from Pre-Columbian times to the present. Organized geographically, the book examines cave use in Central Mexico, Oaxaca, and the Maya region. Some reports present detailed site studies, while others offer new theoretical understandings of cave rituals. As a whole, the collection validates cave study as the cutting edge of scientific investigation of indigenous ritual and belief. It confirms that the indigenous religious system of Mesoamerica was and still is much more terrestrially focused that has been generally appreciated. James E. Brady is Associate Professor of Anthropology at California State University, Los Angeles. Keith M. Prufer is Assistant Professor of Anthropology at Wichita State University in Wichita, Kansas. This volume attempts to bring together a selection of the most recent field research on ritual caves and the latest interpretations of their meaning and significance for modern and Pre-Columbian Mesoamerican peoples. To appreciate the significance of this volume, one has to recognize that the interpretation of cave use within a framework of religion and ritual is a relatively recent development. That is not to say that archaeologists and anthropologists have only recently begun to investigate caves. The history of cave investigation can be traced back more than 150 years, beginning with memorable descriptions by Stephens and Catherwood of such caves as Bolonchen and the Gruta de Chac (Brady 1989:Chap. 2). At the end of the nineteenth century, a number of archaeological studies of surprisingly good quality had been carried out in the Maya area, including Henry C. Mercer's (1975) The Hill-Caves of Yucatan , Edward H. Thompson's (1897) Cave of Loltun, Yucatan , George Gordon's (1898) Caverns of Copan, Honduras , and Eduard Seler's (1901) description of the caves of Quen Santo in the Highlands of Guatemala. After this early period, prior to World War I, when the above reports represented some of the best methodological excavations being carried out, cave investigations all but disappeared as a focus of archaeological investigation between the World Wars. Descriptive cave reports reappear after World War II, but it is not until about 1985 that a self-conscious subdiscipline focused on cave utilization begins to emerge in the Maya area (Brady 1997). The development of interpretive models of cave use contrasts sharply with the history of field investigation that has been sketched above. The first major synthetic statement does not appear until 1959, with the publication of J. Eric Thompson's "The Role of Caves in Maya Culture." Thompson begins the article by noting that "the considerable body of information" on cave use had never been brought together. Combining ethnohistory, ethnography, and archaeology, Thompson enumerates a number of uses of caves, all of which are related to ritual practices. Significantly, he never mentions habitation as a use. He treats even reports of temporary refuge in times of unrest skeptically and notes, "But one may doubt that this kind of occupation was sufficiently prolonged to have had much effect on their contents; most caves in Central America are too damp to be suitable for long residence" (1959:129). This represents a sharp break in archaeological thinking in that it appears that almost all previous writers had assumed without question that cultural remains in caves were related to habitation. This groundbreaking study appears to have gone pretty much unnoticed, in part because it appeared in a publication of Hamburg's Museum für Völkerkunde. Indeed, Ed Shook, an avid bibliophile and Thompson's colleague at the Carnegie Institution of Washington, confessed in an interview that he was unaware of the article's existence (Edwin Shook, personal communication, July 21, 1998). A revised version published in 1975 as an introduction to the reprint edition of Henry Mercer's The Hill-Caves of Yucatan was more significant to the discipline. The accumulation of data in the sixteen years between the two articles allowed Thompson to elaborate the second work into eight named and numbered functions: (1) sources of drinking water; (2) sources of "virgin" water for religious rites; (3) religious rites; (4) burials, ossuaries, and cremations; (5) art galleries, perhaps in connection with religious rites; (6) depositories of ceremonially discarded utensils; (7) places of refuge (a minor use); and (8) other uses. All of these functions were mentioned in the earlier work. It is interesting, however, that a nonreligious function, "sources of drinking water," was added (but dispensed with in a single paragraph) and "places of refuge" was accorded status as a minor function. Most of the newly described functions were pulled from a lengthy section of the first paper, "Other Uses of Caves," so that the section in the second paper called "Other Uses" consists of only two short paragraphs. A serious shortcoming of Thompson's reorganization is its tendency to fragment the central role of caves as loci of religious rituals. In the original article, "Religious Rites in Caves" is the first activity discussed, but it is relegated to the third function in the second article. Thompson must be credited with calling attention to the use of virgin water, but he clearly became enamored of his discovery, as indicated by his elevating it to the second function. From all evidence it is an extremely minor function that should have been treated as an activity associated with the religious role of caves. He further fragmented the central role of caves in religious ritual by elevating several obscure ceremonial uses of questionable importance to the level of independent functions. Thus, "art galleries" and "depositories of ceremonially discarded utensils" should also have been treated as behavioral aspects of cave rituals. It is possible that Thompson saw each cave as having a single, narrowly defined function. In discussing Zopo Cave, he suggests that it may have been dedicated to earth gods, but he raises the possibility that it was devoted to lineage founders, as if these two focuses are incompatible in the same cave (Thompson 1975:xxxiii). Since he defined these uses so tightly, they applied only to caves, and there was little that related to the larger body of surface archaeology. Thompson's fragmentation of a central focus on ritual also made it more difficult to contextualize the functions within the larger social system. It is unfortunate that he made no attempt to indicate how cave-focused rituals articulated within larger religious systems or to assess the importance of caves within Maya society, because there was no one else in the field at the time who was capable of doing so. One aspect of cave use that would clearly indicate the social importance of subterranean features is the relationship between caves and surface architecture. In his earlier work, Thompson (1959:128) says, "Mention should made of caverns beneath buildings, notably the High Priest's Grave at Chichén Itzá, but discussion of them would vastly extend our subject." This is intriguing because it suggests that Thompson was aware of multiple examples that would require an extended discussion. At the same time, the comment is near the end of the paper, so it would appear that he did not consider the matter as important as the other uses that formed the core of the article. In the later work, where space certainly was available, the issue was relegated to "other uses" where Thompson (1975:xlii) simply says, "One should also note Maya structures built over caverns, of which the High Priest's Grave at Chichén Itzá is the most important because of the human bones, worked jades, pearls, and vase of Mexican onyx, all seemingly thrown into the cavern before the aperture was closed." Thompson's failure to develop this theme is interesting in view of Heyden's work (discussed below). In evaluating their impact on the field, it must be recognized that the implications of Thompson's syntheses were not immediately accepted by archaeologists. While Thompson defined caves as spaces where ritual activities occurred, this did not automatically end archaeologists' thinking of habitation as the major cave function. Brady found that throughout the 1980s, the most persistent question archaeologists asked was why Naj Tunich should not be interpreted in terms of habitation. Only after a decade of publications did habitational and utilitarian interpretations begin to disappear in the 1990s, although they still cropped up in some publications on Central Mexico (Hirth 2000; Manzanilla et al. 1996). Also on the negative side, relatively uninformed archaeologists working on caves often used Thompson's article to mask the fact that they had no understanding of what was occurring at their site. Interpretations often consisted of wedging their data into Thompson's very static categories. These comments are not meant, however, to minimize Thompson's contribution. When cave archaeology finally emerged in the Maya area in the 1980s, it coalesced around these syntheses, and they formed the foundation on which the field has been built. At the same time that Thompson's revised synthesis appeared, Doris Heyden took a very different approach in a series of articles interpreting the cave beneath the Pyramid of the Sun at Teotihuacan (Heyden 1973, 1975, 1981). Because she was attempting to explain the placement of a single feature at a particular site, her work focused on the meaning and significance of caves rather than on their function. For Heyden, the placement of the cave beneath the pyramid could be understood only in the context of the role of caves in myth and cosmovision. While Thompson used ethnography and ethnohistory, Heyden drew even more heavily on these sources, perhaps because fewer archaeological data were available for Central Mexico. This, along with the focus on meaning, tended to embed her work in an explicit social context. Heyden (1975:134), it is important to note, directly addresses the question of the importance of caves in Mesoamerica. The prevalence of -oztoc, Nahuatl for "cave," in the site names of Central Mexico and the presence of the cave motif in site glyphs, led Heyden (1975:134) to conclude, "They constitute an important element in town sites." While Heyden was cautious in her wording, others recognized the implications of her argument. René Millon (1981:235), for example, says explicitly, "Nevertheless, the stubborn fact remains: the pyramid must be where it is and nowhere else because the cave below it was the most sacred of sacred places. Whether or not the Teotihuacanos believed that the sun and the moon had been created there, the rituals performed in the cave must have celebrated a system of myth and belief of transcendent importance." The articles about the cave beneath the Pyramid of the Sun were not Heyden's only contribution to cave studies. In "Los ritos de paso en las cuevas," Heyden (1976) explores the possibility that caves were regularly used in rites of passage. She examines documentary evidence to show that caves played a role in a number of rituals from birth to death. These ceremonies may have been some of the most important in the society. She is probably the first to suggest that at least a portion of the ascension ritual of rulers was held in caves (Heyden 1976:21). It is also interesting that, whereas most investigators have connected caves with ceremonies in the agricultural cycle, she has related cave use to the individual life cycle. Unfortunately, the article has tended to be ignored, perhaps because it was published in Spanish. It hoped that with the publication of an updated version in English in this volume, it will receive more attention. In other articles, Heyden considers the role of caves as an important feature of the sacred landscape (1983) and their association with birth and fertility (1987a, 1987b, 1991). Her work is significant in developing a model of the meaning of caves that can be used to explore why they were being used in a particular manner. The articles on the cave beneath the Pyramid of the Sun are particularly noteworthy because they ascribe an importance to caves that is of an entirely different order from anything suggested in the literature at that time she was writing. On the negative side, the often-noted separation of Mesoamerica into Central Mexico and the Maya areas is quite apparent in the writing of both Thompson and Heyden, as neither cites nor appears to be aware of the other's writing. If Heyden, in particular, had been aware of Thompson's synthesis and had seen the reference to the High Priest's Grave, it might have suggested that the cave/architecture relationship she noted at Teotihuacan was part of a widespread pattern. Barbara MacLeod and Dennis Puleston's "Pathways into Darkness: The Search for the Road to Xibalbá" (1978) differs significantly from previous works. While professing to draw from a broad range of sources, including epigraphy, iconography, and ethnography, the authors actually utilize relatively little published material and do not even cite Thompson's or Heyden's work on caves. Instead, the article relies on MacLeod's and, to a lesser extent, Puleston's fieldwork. This in itself sets the work apart as being the first theoretical discussion by archaeologists with extensive cave experience, since neither Thompson nor Heyden had actually worked in caves. That experience allowed the authors to discuss artifacts within their original archaeological context and permitted them to make convincing suggestions about behavior, such as the placement of children's skeletons in rimstone dams, which suggests child sacrifice. Their main theoretical thrust is to associate caves with the Underworld, a model that is constructed from the Popol Vuh and Lacandon Maya ethnography. In discussing rites and activities within caves, however, the authors mention rain ceremonies and refer to cave-focused deities as the owners of the mountains, game, or lightning and the givers of maize. All of these activities and figures tend to be associated with the earth in indigenous thought rather than with the Underworld. In the final theoretical article to appear before the beginning of a formal cave archaeology, Mary Pohl and John Pohl (1983) propose that rituals resembling the cuch ceremony (involving the sacrifice of a deer and a peccary) may have been performed in caves by the ancient Maya. The outline of the cuch ceremony, drawing on Mary Pohl's (1981) earlier work, is quite convincing, but only the most circumstantial evidence is presented to tie the ritual to caves. A central feature of the cuch ceremony, the raising of a pole to represent the world tree, is related to several native informants who identified ribbed stalagmitic columns as ceiba trees, the world tree of the Maya. The authors note as well that deer bones and sacrificial blades have been recovered from caves. Finally, they suggest that caves may have played a role in some part of accession rituals. Here again, they produce little evidence to mount a convincing argument for such a connection. Nevertheless, the article is important for recognizing caves as "the most sacred precincts of the Maya" (Pohl and Pohl 1983:28) and for raising the point that they were important enough to be the site of the society's highest politico-religious ritual. It is quite clear from the preceding summary that when the subdiscipline of Mesoamerican cave archaeology arose around 1985, it had a remarkably small body of theoretical and interpretive material to draw on. A critical factor in this lack of development was the absence of cave specialists. While the lack of specialists affected all aspects of cave research, one of the most seriously impacted areas was cave scholarship. Other than Thompson and Heyden, none of the earlier investigators were aware of the large corpus of published material that already existed. Later work, therefore, did not build on the foundation laid by earlier studies. Lacking a dialog with comparative material, reports rarely rose above the level of elementary data presentation and, as a consequence, almost never produced meaningful interpretive conclusions. The major early works by cave specialists since 1985 attempted to address the lack of scholarship. There appears to be a self-conscious attempt to order and synthesize the data so that patterns begin to emerge. Juan Luis Bonor (1989) provides a number of topical summaries in the early chapters of Las cuevas mayas: Simbolismo y ritual and then attempts to compile an encyclopedic inventory of all known Maya caves. Brady's (1989) dissertation presents a chronological development of cave investigation and contains hundreds of references. A chapter entitled "Use and Meaning of Caves" covers a number of themes and contains literature reviews, and Brady conducts comparative analyses for each section of the site report, including such things as ceramics, artifacts, and skeletal material. Finally, the forty-seven-page bibliography is meant to serve as a guide to the cave literature. He later replaced it with an annotated bibliography, Sources for the Study of Mesoamerican Ritual Cave Use , which formally defines the field's literature (Brady 1996, 1999). This synthetic thrust is no better illustrated than in Andrea Stone's (1995) Images from the Underworld: Naj Tunich and the Tradition of Maya Cave Painting . Before this work, one could reasonably question whether there was enough evidence to justify "Art Gallery" as one of Thompson's (1975:xxxvi) major cave functions. Stone's exhaustive survey of all known Maya cave painting sites assembles a huge body of data that is far more extensive than the field realized at the time. Stone, like Brady, also tends to view cave use in a Mesoamerican perspective, so that data from sites in Central Mexico are presented as well. She uses her data as well as information from iconography, epigraphy, archaeology, ethnography, and ethnohistory to provide an extensive discussion of cave use. A second change resulting from the formation of a specialized subdiscipline is that interpretation is now led by field investigators, which has altered the direction of interpretation in a number of interesting ways. In earlier interpretive works, writers using folklore, iconography, ethnohistory, and ethnography tended to deal with the concept of the cave rather than with any physical reality. This relegated archaeological evidence to a minor role. Even when archaeological data were invoked, they tended to be used very uncritically. For example, Thompson, who was the best at employing such data, simply notes the presence of sherds on the floor of caves as evidence for the collection of virgin water, something that no cave archaeologist would accept today. Since the 1980s, however, archaeology has been at the forefront of Mesoamerican cave studies, and the archaeological record is regularly used as the critical evidence in mustering support for an argument. This expansion of the cave literature has meant that interpretations have tended to be less speculative and more heavily grounded in data. This orientation is evident in art history in the contrast between Andrea Stone's work and that of Karen Bassie-Sweet. The core of Stone's (1995) book is data that she collected herself, augmented by a careful combing of published sources. She is clearly mindful of cave context and comfortable with archaeological data. Bassie-Sweet (1991, 1996), on the other hand, had little experience with caves at the time she was writing and rarely uses archaeological data. The highly speculative nature of her proposals also appears to be a throwback to earlier interpretive efforts. Finally, the role of ethnography in cave studies has been extremely curious. Sapper (1925:192) may have been the first to suggest that the ancient Maya probably treated caves as sacred places, much as the modern Q'eqchi' do. There are also a number of early ethnographies, particularly from Oaxaca (Beals 1945; Parsons 1936) and the Maya area (Redfield and Villa Rojas 1934) that record substantial amounts of data on caves, but none of these provide what could be considered an extended theoretical discussion of these features. In the postwar period, moreover, mention of caves declines as ethnographers steered away from what they considered an "idols behind altars" topic. Caves tend to be mentioned only in passing since World War II, so, although all of the interpretative writers mentioned above made explicit and extensive use of ethnographic analogy, ethnographers have not played a central role in the resurgence of cave studies. This is illustrated by the fact that there are few article-length publications dealing with cave ceremonies. Interestingly, the first article that we have found devoted to a cave ceremony is Jarslaw Petryshyn's (1969; see also Barrera Vásquez 1970; Uke 1970) description of a Lacandon rite, which has been translated for this volume. For Central Mexico ethnographic articles focusing on cave ritual are almost nonexistent (Grigsby 1986). Evon Vogt is a notable exception to this generalization about the role of ethnography, in part because he has been interested in using ethnographic data in the interpretation of the ancient Maya for over forty years. Although he does not focus primarily on caves, Vogt's proposal that pyramids represent sacred mountains has proved particularly useful to cave archaeologists (1964a). He has also noted the importance of cave shrines in communication with the supernatural (1964b; see also Blaffer 1972 and Laughlin 1977 on Zinacantan). 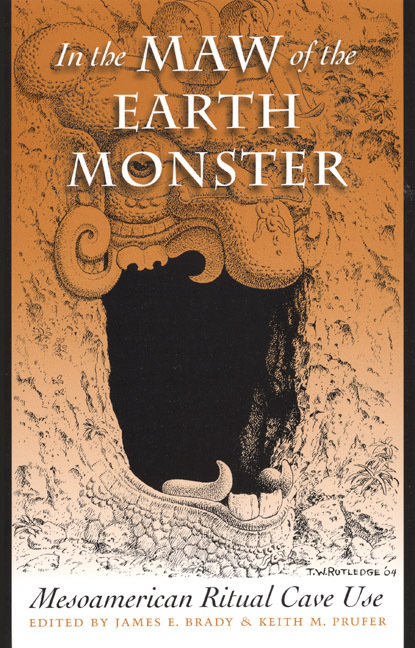 Vogt's (1969, 1976) enthnographies provide some of the most extensive discussions of the use of caves, and his (1981) analysis of sacred sites within a landscape approach has heavily influenced the thinking of the current generation of cave archaeologists. Fortunately, there does appear to be a resurgence in interest in caves within ethnography, as evidenced by recent contributions concerning all areas of Mesoamerica (Christenson 2001; Knab 1995; Kohler 1995; Manca 1995; Monaghan 1995; Pitarch Ramon 1996; Sandstrom 1991; Wilson 1995). The present volume grew out of an invited session, "Integrating Ethnography and Archaeology: Caves in Modern and Ancient Maya Ritual Life," at the 1994 American Anthropological Association meetings in Atlanta, Georgia. An emphasis on the complementarity of ethnography and archaeology is evident in the present volume. Among our contributors, Abigail Adams, James Brady, Doris Heyden, and Evon Vogt were participants in that session. Dennis Tedlock and Jaime Awe also gave presentations. The other major contribution to the volume is a cave session organized by Patricia Austin and Keith Prufer at the 1997 Society for American Archaeology meetings in Nashville, Tennessee. That session broadened the focus of the present volume from the Maya to encompass all of Mesoamerica. Jaime Awe, Cameron Griffith, Sherry Gibbs, Clifford Brown, Prufer, Janet Fitzsimmons, and Andrea Stone were participants in Nashville. In assembling this volume we have endeavored to encapsulate the breadth of current knowledge of cave use in ancient and contemporary Mesoamerica. What becomes apparent is the strong continuity between the archaeological past and the ethnographic present with respect to the use of caves by indigenous peoples of Mesoamerica. Ethnography and archaeology link caves to fundamental belief systems of peoples who see themselves as an integral part of an animate and life-sustaining earth. These systems transcend religious doctrine and implicate themselves in every facet of political, spiritual, and social existence. There is no aspect of Mesoamerican life that is not linked to the belief in a living world, the central features of which are the powerful symbols of mountains, water, and caves. We have found that caves are points of access to the central focuses of these belief systems. The true sources of power exist inside the mountain, in a mythical time and place that has been vividly portrayed in all available mediums since the dawning of social history. Caves are portals—places where humans have attempted to intervene and mediate with the forces that make the universe animate. This book draws on the experiences of anthropologists and art historians who have set out to explore the relationship between humans and the sacred earth. The authors come from varied perspectives and backgrounds and look at their data as archaeologists, linguists, and ethnographers. They all, however, reach a similar conclusion: that Mesoamerican peoples' use of caves is and has been a fundamental part of the character of their social life. The chapters by Stone and Moyes bring new perspectives on the use of cave-spaces by the Maya, as well as insights into the interrelationship between artifact distributions and cave morphology. The idea that caves were utilized in a manner that took into account their spatial layout is not new (Brady 1989:415; 1997), but these are sophisticated and synthetic explorations both of which find distinctive patterning in cave deposits that demonstrate repeated and purposeful ordering of archaeological features. The authors examine enduring Maya patterns of directionality—vertical and horizontal—and cruciform that have been aptly discussed in ethnographic (Hanks 1984:136; Sandstrom 1991) and iconographic literature (Coggins 1980; Freidel and Schele 1988:426n7) in cave contexts with favorable results. Stone (Chapter 10) uses pan-Mesoamerican cognitive models to propose that the intentional ordering of cave-spaces was a critical element in the structuring of ritual activities, and that this ordering was accomplished in both traditional and innovative ways. She draws heavily on iconographic models of the cosmic grid, with its horizontal and vertical divisions, color-directional symbolism, and concepts of the multilayered universe, to support her proposal that caves represent an ideal laboratory in which spatial analyses can illuminate specific ritual behaviors. She astutely notes that cognitive models she believes motivated the placement of cave artifacts are extremely difficult to verify from archaeological evidence alone, especially where contexts have been disturbed by looting, natural disturbances, or other degradations. Moyes's chapter (Chapter 11) takes spatial analysis into the cave, as she looks for patterning in cave morphology and artifact distributions that may produce archaeological "signatures" useful for comparative analyses. Like Stone, she asserts that the formal and repetitive characteristics of ritual behaviors should be exhibited in the material remains of the activities in meaningful ways that are detectable by archaeologists. Moyes's laboratory is the spectacular cave Actun Tunichil Muknal, located in central Belize—a largely undisturbed five-kilometer tunnel that contains evidence of repeated and long-term ceremonial use. She applies technologically sophisticated Geographic Information System (GIS) to facilitate a global assessment of artifact placement and distribution patterns. Her study indicates that multiple cognitive spatial models resulted in clearly bounded clusters of artifacts that have internal patterns within larger intentionally modeled groupings. Awe, Griffith, and Gibbs (Chapter 9) also focus on Actun Tunichil Muknal, though their interest lies in the two shaped slate monuments on a high ledge deep in the cave. The two monuments are carved to resemble a stingray spine and an obsidian blade, implements associated with autosacrifice by bloodletting in Pre-Columbian texts and art. They argue that cave monuments are a regional tradition in central Belize and document two additional examples from Laberinto de las Tarántulas and Actun Chechem Ha, and that slate was a preferred medium for these monoliths. They also link the use of the cave and the stelae to nearby surface sites where similar carved monuments are found. Chapters by Adams and Brady and Stuart and Vogt take ethnoarchaeological approaches to the investigations of cave utilization by the modern and the Pre-Hispanic Maya. Both papers draw heavily on the terrestrial orientation of Maya religions and conclude that elements of modern ceremonial behaviors were almost certainly present in ancient ritual activities. Adams and Brady (Chapter 12) look at Q'eqchi' Maya cave pilgrimages, the identification of pilgrims with the earth deity, the Tzuultaq'a, and the offerings to this deity. Their data are important, since they detail not only specific types of offerings made during pilgrimages, but also the ritual importance of the objects offered. They also demonstrate that while rituals performed in caves are solely the domain of men, women are a critical element in the acquisition of ritual paraphernalia and offerings made outside of the cave. Participation of each person involved in petitioning the Tzuultaq'a is conditioned by gender, and the deity is marked by both female and male attributes. Vogt and Stuart (Chapter 7) also utilize ethnographic data from the well-studied region of Highland Chiapas combined with the recent identification of the hieroglyphic toponym for cave to discuss long-standing continuity between past and present cave-focused ceremonial activities. Their ethnographic analysis illuminates how deeply intertwined earth symbolism and features from the natural world form a broad system in which metaphor and action create a sacred and animate universe. The recent interpretation of a glyph meaning "ch'een," or "cave," has far-reaching implications for our understanding of how the Maya interacted with the sacred landscape. While archaeological and analogical data have increased interest in and understanding of cave utilization in ancient Mesoamerica, the role of elite segments in these activities has been largely conjectural. This new evidence from indigenous texts indicates that caves were an important concern of elites and refocuses discussion on the larger implications of political discourse on the sacred landscape. Pure ethnographic research is at the heart of chapters by Petryshyn and Sandstrom, both of whom approach cave ceremonialism from very different perspectives. The chapter by the late Jaroslaw Petryshyn (Chapter 13) is included here for its description of a cave ritual by the Lacandon of Chiapas. Descriptions of cave rituals are, by virtue of their secretive nature, rare in the ethnographic literature. Petryshyn's account, based on fieldwork conducted in 1968, is the first to report on a Lacandon religious ceremony in a cave. The cave described is named after the god Tsibaná, who is consulted during heavy rainfalls and is prayed to for success in agriculture. He resides in a cave that bears his name. Petryshyn's account leads us from the village to the cave and guides us through a detailed description of the protagonists and events that transpired. Sandstrom's chapter (Chapter 3) examines earth symbolism and cave-focused rituals of the Huastecan Nahua of Central Mexico. He demonstrates that indigenous knowledge of the earth manifests itself as an intersection between science and religion, with all objects and beings having sentient and animate qualities; this knowledge is the "symbolic rendering of empirical fact." Elaborate myths become an explanatory mechanism that perpetuates and invigorates these beliefs. Nahua cave-focused activities and beliefs are but one manifestation of these complex relationships. Sandstrom's data point repeatedly to the role of ritual specialists in mediating human needs with earth deities in the cave context, a theme revisited in most of these chapters. Heyden's chapter (Chapter 2) is a synthetic review of literature regarding the use of caves in the Valley of Mexico. She draws data from both early colonial documents and modern ethnographic accounts. She contrasts those events that can be loosely defined as "rites of passage" with other specialized ceremonial behaviors. Heyden was one of the first researchers to examine the link between mythology and cave utilization, and her data are rich and detailed. The metaphors for creation and birth, so prevalent in Mesoamerican myths, link caves to the origins of humans and deities alike. Like Sandstrom, Heyden finds that rain and water are dominant themes in cave-focused beliefs and actions, and that the importance of deities responsible for these life-giving elements is pan-Mesoamerican. Her work also strongly implicates earth-focused belief systems in the healing and illness complex, with caves being the focal point for offerings and prayers to ensure health and well-being. Prufer (Chapter 8) examines the roles of ritual specialists as a fundamental social feature in traditional societies and proposes that archaeological data can inform us on the types of actors involved in ceremonial cave activities in the past. Drawing on data from one of the most extensive cave surveys in the Maya Lowlands, he examines cave morphology, artifact types, and artifact distribution patterns to support his proposition that there were two fundamental types of protagonists represented in Classic Period cave contexts: political actors attached to ruling institutions; and shamanic individuals, who were more peripheral to statecraft and the posturing of elites. These actors likely used spaces in very different ways and toward differing ends. Political aspirations were expressed in legitimation ceremonies held in open and well-lighted cave spaces. More restricted specialists operated in dark cave interiors. Rockshelters are an important part of this equation, with evidence of repeated mortuary use and evidence of large-scale burning and massive offerings. Two chapters deal with the archaeology of caves in Oaxaca. Rincón (Chapter 6) examines the little-known wealth of cave sites in the Coixtlahuaca Basin located in the northernmost section of Oaxaca's Mixteca Alta. He notes early missionaries' accounts of cave cults that flourished throughout the highlands of Mesoamerica on the eve of the Spanish conquest, with special attention to interior cave paintings and examples of ceremonial behaviors. He compares these accounts to archaeological data from several spectacular cave sites in the basin, with the aim of better understanding the continuity between Pre-Columbian and historical use of these sacred spaces. Fitzsimmons (Chapter 5) reports on the archaeology of Blade Cave, located in the Mazatec region of Oaxaca, and one of the few caves from this region ever subjected to archaeological investigation. Her detailed descriptions of artifact distributions link the historical and prehistoric use of the cave to local and regional sites and places the region in a framework of larger Mesoamerican cave traditions. Two chapters focus on the prehistoric use of caves in the Yucatán Peninsula, a region where subterranean spaces were both sacred portals and the sources of life-sustaining water. This region is particularly difficult to understand archaeologically, in part because caves were used for both secular and religious purposes, a phenomenon that is uncommon elsewhere in Mesoamerica. The chapter by Brown (Chapter 15) proposes that caves and cenotes at the Postclassic capital of Mayapán were more important in determining settlement patterns than they were in the relatively well watered highlands. He stresses that both their utilitarian function and their ideological significance are deeply intertwined. Cave features became cosmological centers of Yucatecan communities, and this significance is reflected in both the spatial arrangements of architecture in the landscape and the written and oral history of the Maya. Rissolo's chapter (Chapter 14) focuses on caves in the Yalahau region of Quintana Roo, near the surface site Tumben-Naranjal and the secondary center of San Cosmé, which are linked by a three-kilometer-long sacbe (literally, "white way"; a raised road). This region is wetter than Brown's study area in the northern Yucatán, and though there are many water-bearing caves and cenotes at Yalahau, they are neither the only nor the most accessible sources of water. Still, these water sources were the locations of considerable ceremonial activity, even when it was difficult to access very modestly sized pools. Rissolo documents the regular maintenance of cave passages and the frequent occurrence of rock art near the pools. The draw of these caves was both the presence of water and, possibly, the specific symbolic importance of water from underground spaces. In addition, access to many caves may have been restricted; vertical and modified entrances indicate that at least some caves were hidden or their use was discouraged. Like Prufer, Rissolo recognizes that rockshelters were conceptually the same as caves, though they may have functioned as more open and publicly accessible spaces. Finally, in our concluding chapter we examine the role of cave studies in modern anthropological and archaeological thought. We review the production of comparative models and appraise the value of regional and local analysis. Despite growing interest in sacred landscapes in the study of prehistory, there is still strong skepticism about methodological approaches used to understand ancient religious thought and action. We attempt to look at the history and causes of this skepticism and propose new directions for the field of Mesoamerican cave archaeology.